Is it impossible to assess dignity, which is the faculty or agency of autonomy and equality of rights under the current rule of law, when we are met by global challenges like climate change, financial crisis, food crisis, natural disasters, inequality, violent conflicts and trade disputes? 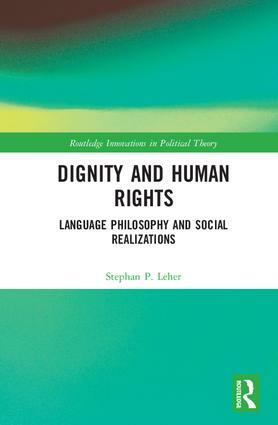 Drawing on European philosophical enlightenment to rethink dominant theories of contemporary Western Human Rights, Stephan P. Leher explores the philosophical foundation of the concept of “dignity” and Human Rights. Using specific examples from Africa and Latin America to explain these concepts as social realizations in the world, Leher demonstrates the link between justice and peace and contends that dignity, freedom and Human Rights law rule are social realizations and claims by all people. With the help of language philosophy, he argues that sentences and propositions about social choices and realizations of real life expressed in ordinary language constitute the basic elements of the foundation and protection of human dignity and Human Rights. The social choice to claim one’s freedom and rights can be considered the dignity agency of the individual. Dignity and Human Rights sheds new light on the academic assessment of dignity, the agency of autonomy and the equality of rights under the rule of law, in a time of changes and challenges to Human Rights policies and politics. 1. The End of History or the Beginning of a Human Rights History? 4. There Is a Plurality of Understandings and Realizations of the Concept "Human Dignity"
9. A Question to be Answered by Empirical Social Research: Are Women and Men Conscious of Their Dignity in Relation to the Quality of Their Social Choices and Social Realizations? Stephan P. Leher is Professor of Moral Theology at the University of Innsbruck, Austria.